Getting makeup to look flawless throughout the day is challenging when you have perpetually oily skin. Foundation breaks down, eyeshadow creases, and blush nearly fades away by day’s end. So, what do the pros know about long-lasting makeup for oily skin that you don’t? We’re unlocking our vault of tried-and-true tricks, and revealing the best products for oily skin. Next, reach for a product with SPF that hydrates but isn’t greasy, and follow up with a mattifying primer for oily skin. Try our SHINE STOPPER Instant Matte Finish, which features MICROSPONGE® technology to keep oily shine in check while also minimizing the appearance of pores. Generally speaking, makeup products labeled matte and/or long-wear tend to be a step in the right direction for those with an oily complexion. When it comes to concealer and foundation for oily skin, liquid matte formulas tend to perform the best, delivering long-wear, yet natural-looking results. 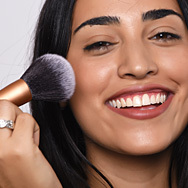 Avoid stick foundations or creamy compacts, which can feel occlusive on oily skin. Setting your foundation with an ultra-fine powder can help, giving you longer wear as well as a sheer layer of shine control. When touching up with powder, blot the excess oil on your skin first—otherwise, the mixture of oil + powder can create a cakey, grimy look. One more way powder helps oily skin: It allows blush and contour powders to go on more evenly and helps both resist fading. By the time 2 PM rolls around, your oily eyelids may have gotten the best of your eye makeup, but that’s avoidable if you prep with the right eye primer. One of our favorites is Urban Decay’s Primer Potion, which locks eye makeup in place, while also absorbing the oil that would otherwise lead to creasing, smudging, and fading. While you can’t “stop” oily skin, there are definitely skincare steps you can take to minimize it, beyond what we’ve discussed here. Check out our article Help for Oily Skin for more tips, including how to find the best moisturizer for oily skin.